I was out with some friends on Friday night, having a few drinks. Those few drinks turned into a few more when we came up with the idea that we needed a drink special during these tough economic times. 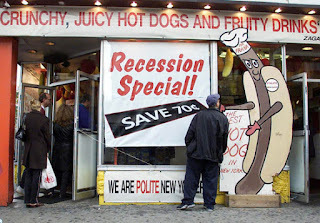 It was to be called "The Recession Special". We ordered it up from the bartender, not knowing what to expect. She came through with flying colors when she offered us up some well Bourbon shots. It was fitting. Bourbon reminds me of old times... and it's an all American whiskey. It makes me think about guys down in Kentucky and Tennessee, crushing grain into mash to make Bourbon during Prohibition. Along with moonshine of course. And those were the years leading up to the Great Depression. It all made perfect sense as we head down that same road. So, hit your local watering hole and order up the Recession Special. If they don't know what it is, just tell 'em.